A concrete stave silo wall failure. 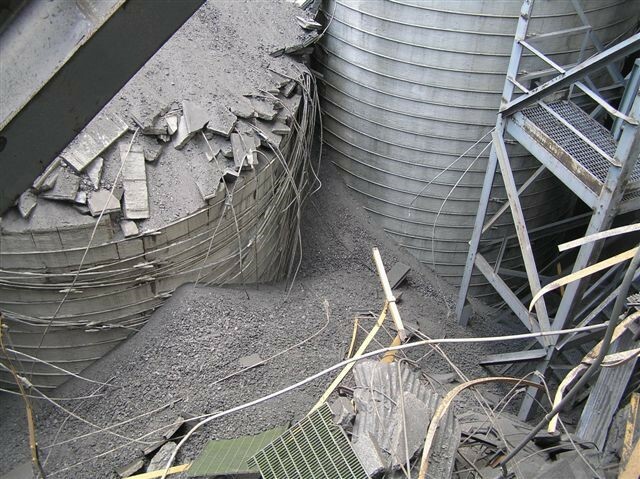 The above picture shows a wall failure in concrete stave silos that used steel galvanized hoops for structural integrity. Originally designed for silage storage in agricultural markets, these silos are typically of simple design with a gravity fed, bottom center discharge location. 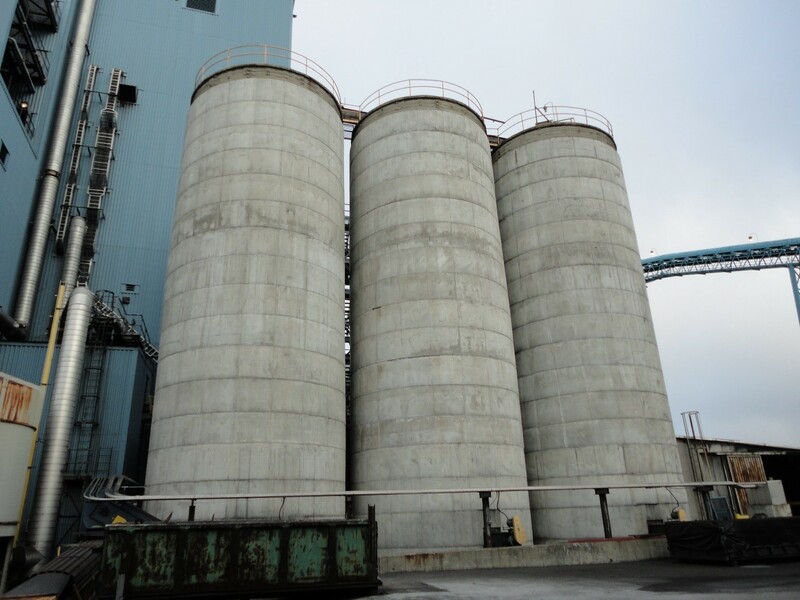 As industry grew and advantages of silos for bulk storage of loose materials were recognized, stave silos were put to use in new markets. Though the silo above was inspected regularly, buildings around the silo impeded the view of specific areas. In this case, the silo failed due to rusted steel galvanized hoops around the silo. The deterioration and inaccessible location of the hoops meant the structural member eventually broke and caused the collapse. It is imperative that stave silos be inspected regularly to ensure their safe operability. A collar wall, utilizing reinforced, poured in place concrete Jumpform technology, was added to the three silos above to add structural integrity and prevent additional wall failure. A unique solution was engineered based on the customer’s specific application. Using the existing foundation, a new steel reinforced concrete wall was implemented around the full circumference of the silo from grade to top. All penetrations and openings were placed for this application to operate as efficiently and safely as possible. Repairs of this nature are not inexpensive; however, they are more cost effective than building an entirely new silo for changing applications and markets. It is imperative that stave silos be inspected regularly to ensure their safe operability. As times change and new factors are integrated with an older structure, modifications should be considered at the same time for safety and efficiency.